The ‘Make One For Yourself’ series of courses will offer a little insight into the process involved with making some of Ciaran McKay’s, wood products. Included in the courses are how to create a cheese board and pendant as well as one to one sessions. These will be an introduction to the wood working process that Ciaran uses, and will offer an insight into a day working with Ciaran. 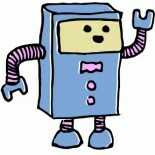 This entry was posted on 03/03/2013 by Creatabot in Creative and Art Events, Creative Opportunities.